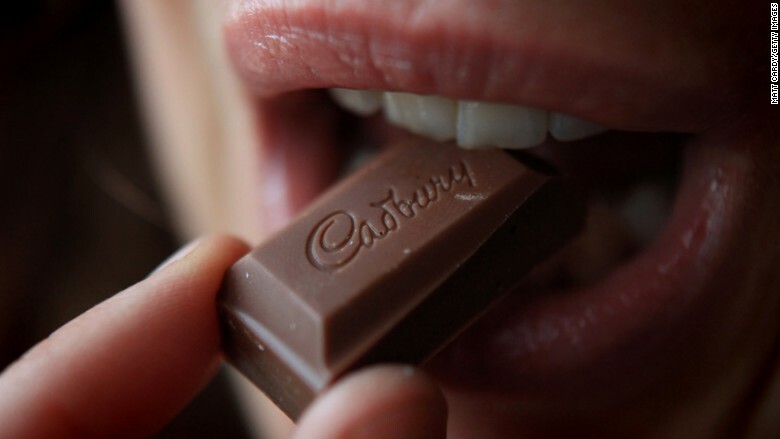 Activist investor bought a 7.5% stake in Mondelez, the food company behind Cadbury chocolates. Activist investor Bill Ackman has bought a big fat $5.5 billion stake in Mondelez, a food conglomerate with well-known brands like Ritz crackers, Oreo cookies and Cadbury chocolates. Ackman's hedge fund, Pershing Square Capital Management, said late Wednesday night that it has acquired 7.5% of the shares of Mondelez International (MDLZ). U.S.-based Mondelez is a massive company with a global reach. Revenues for the first half of the year exceeded $15 billion. "We welcome Pershing Square as investors in our company," said Mondelez. "We'll continue to focus on executing our strategy and on delivering value for all our shareholders." The investment landscape of the food industry is changing dramatically, and Ackman's move suggests that now Mondelez could be in play. The merger of Heinz and Kraft was completed last month to form Kraft Heinz (KHC). That company is co-owned by another famous investor, Warren Buffett of Berkshire Hathaway (BRKA). Mondelez was once a part of Kraft and got its name when it was spun off into a separate entity in 2012. Adding to the intrigue surrounding Ackman's investment: He's not the only activist investor involved in the company. Mondelez added Nelson Peltz, CEO of the hedge fund Trian Fund Management, to its board of directors last year. That came after Peltz stopped pressuring Mondelez to merge with PepsiCo (PEP). Peltz is a prominent stakeholder in both companies. Pershing Square declined to comment Thursday and Ackman was not available. Mondelez did not immediately return messages. Ackman is closely associated with Herbalife (HLF). He made a billion dollar bet several years ago that the stock on the nutrition supplement company would go to zero. Ackman has said Herbalife is a pyramid scheme, a claim the company has bitterly contested. Herbalife shares are up 30% this year.